Hi, I’m Maryam, and I just finished a 4-month internship at IPIS. As I am leaving the team with a handful of experiences and prepare for my next challenge, here are some thoughts I wanted share about my internship! What do you do as a GIS intern, you might ask. Well, during the first week of my internship things got serious pretty fast as I helped organise one of the Missing Maps Mapathons which are regularly hosted at IPIS. During such events, volunteers digitise roads and buildings from satellite imagery of remote places to complete OpenStreetMap – a map free to use for all, and in frequently used by NGO’s. 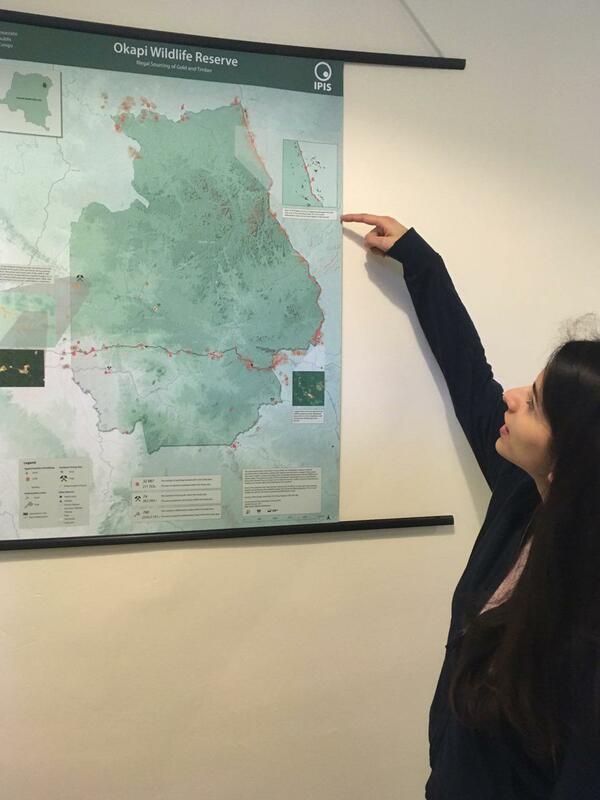 This specific event focussed on mapping illegal mining and logging activities in the Okapi Wildlife Reserve in DRC, and from this followed my first task: downloading the digitised data from OpenStreetMap and creating a printed map from the park. This was the first time I used QGIS for a mapping project of this size. The experience of exploring through satellite imagery of DRC was super cool. I learned a lot in the process and I realise now that in order to learn GIS, you really need to work with it on an actual project. Then you will get to learn the best methods to use and the best tools for a certain task. As a result of my work, the map I made is now used in the field to inform park rangers and staff during their daily work. From the beginning of my internship, I got a very warm welcome from the team. Everyone was friendly and supportive of new interns. I received a great deal of support and motivation from the GIS team: Manuel and Alex. They both provided me with necessary technical supports while giving me confidence and trusting me with performing certain tasks on my own. I learned to work both independently and as a part of the team. More importantly, as I was expecting, the work was challenging enough for me so I almost never got bored or felt like I was wasting my time. After completing my first map, I learned about statistics and data analysis, performed some georeferencing, worked on another large mapping project, and learned about conflict mapping. 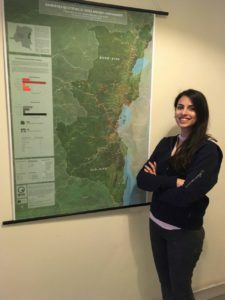 Interested in joining IPIS as a GIS intern? Check our vacancies and apply now!